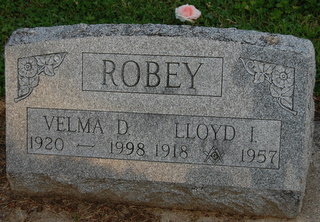 She married Lloyd Irvin Robey1,3, Jul 8 19391,3 [Jul 7 19395], Bakers Corner, Hamilton County, Indiana1,3. Lloyd, son of Berton Alonzo Robey & Elzora Jane Mills, was born May 25 1917, Zionsville, Boone County, Indiana.1,3 (His gravestone shows he died in 1918,3,5 in error3 ). Kathy Doris Robey, born Sep 14 1950; married 1) John D. Favrot (sons: Scott Douglas Favrot, Sep 28 1978, m Lindsay Begley [children: Wyatt Blake and Charlotte Ann]; Nicholas Kyle Favrot, Jul 19 1981, m Sandra Danielle Pressley [children: Landin Kyle; Jadeyn Danielle]); married 2) Charles Bruce Hammond, Jul 24 1992 (email: ). Monte Alonzo Robey, born Dec 1 1951; died Feb 16 1976; unmarried. Robey, Lloyd, head-of-household, age 21, born in Indiana; completed 4 years of high school; on Apr 1 1935 was living in the same place/town; rented home ($12/month rent); occupation: asst. printer, local paper; worked 52 weeks in 1939; $780 wages in 1939. Robey, Velma, wife, age 20, born in Indiana; completed 4 years of high school; on Apr 1 1935 was living in rural Hamilton County, Indiana. Contribution from Beth Robey (). 1940 census, Zionsville, Boone County, Indiana; roll T627-1028, ED 6-11, page 2B, line #51, household #37. North Carolina, Death Collection, 1908-2004; http://www.ancestry.com. Contribution from Kathy (Robey) Favrot-Hammond.